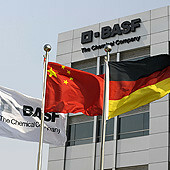 GERMAN firm BASF and the SGL Group will jointly develop a composite material based on a reactive polyamide system and suitable carbon fibres, for the production of thermoplastic carbon fibre-reinforced composites, for use in the T-RTM process (Thermoplastic Resin Transfer Moulding) as well as the reactive injection moulding process. Besides being cost effective, the material permits considerably shorter processing cycles than conventional thermosetting RTM. The adjustment of the material sys-em to these faster processing techniques plays a major role for the entry of light and high-strength structural components made of carbon fibre composites into automotive mass production. As a leading producer of polyamide and caprolactam, a precursor of polyamide, BASF is contributing its competence in the development of new polymer matrix systems. The SGL Group is utilising its material expertise along the carbon fibre value-added chain and in high-temperature processes. To achieve good wetting of the fibre and short cycle times in T-RTM or reactive injection moulding, the firms start from low-viscosity highly reactive caprolactam formulations. In order to attain an optimal bonding of the polyamide to the fibre, the new matrix systems require that a suitable carbon fiber surface treatment, the so-called finish, will be developed.